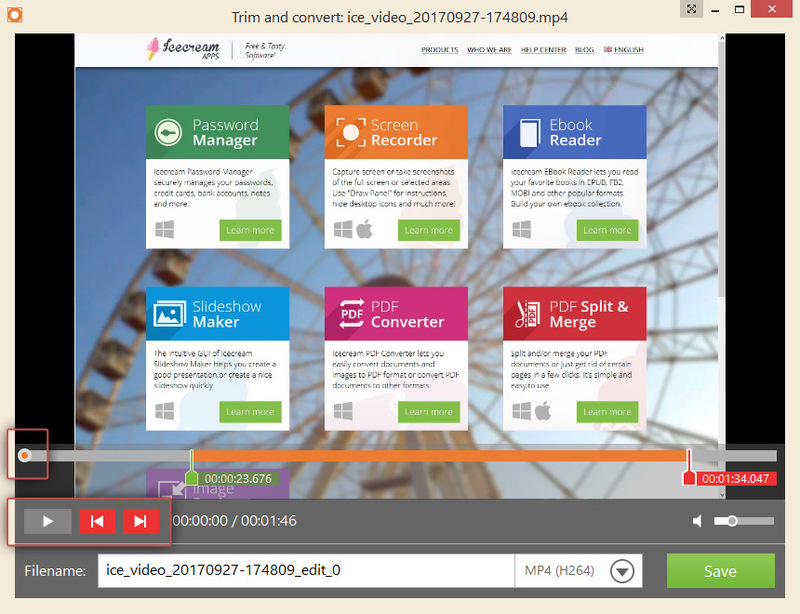 Since 4.70 version of Icecream Screen Recorder for Windows there is the feature to trim the beginning and the end of the videos recorded with the program. This feature is extremely helpful for those who accidentally recorded some extra seconds . Please note, that so far this feature is available from the History panel of Icecream Screen Recorder for Windows only. Also, you can cut the parts of the videos at the beginning and at the end only. Read on to learn more about how to use this feature. Please download Icecream Screen Recorder from our website in order to have the latest version of the program available. Run the installation process and launch the program as soon as the setup process is complete. The trimming video option is available for the videos that are shown in the History panel of the screen recording software. Record a video in order to cut its parts (beginning or end) further on. Here's the guide on how you can record videos with Icecream Screen Recorder. As soon as a video is recorded, the main window of Icecream Screen Recorder will turn into the History panel. To open the video editor and trim a selected video, press the pencil icon to the right of the video in the “Edit” column. Note: If you don't see the “Edit” column in the History panel, most likely you're using an outdated version of the program. Make sure you're using 4.70 or later version of Icecream Screen Recorder for Windows. You can check the current version of the program at the top of the Settings panel. The selected video is now opened in a new window. Please pay attention to the green label at the left side of the video's timeline (right under the video) and to the red label at the right side of the timeline, these are the tools to define the new points of the video's beginning and end. Hover the mouse cursor over any of these 2 labels (green to trim the beginning and red to trim the end) so that the mouse cursor changes to a horizontal arrow symbol. As soon as the cursor's icon is changed to the arrow, hold the left mouse button and drag the selected label (green or red) to the right position on the timeline; release the mouse button to apply the selected location of the label on a timeline. Another way to move the labels is to first select which label (green or red) you want to move is by clicking it. After that the label's white border gets thicker. You may use the left and right green arrow buttons to move the label by frames of the video. The round marker that is located on the timeline of the video defines the start of the video's playback. Place the round marker on the timeline to play the video from the right moment with the help of the green “Play” button. After both green and red labels are placed into the right places press the green “Save” button to apply the changes and save the new trimmed video. When the editing of the video is complete and the changes are applied, a new pop-up window will appear. Press the “OPEN FOLDER” button to open the output folder with the processed video. Press the “CONTINUE” button to resume editing of the current video. Press the “CLOSE” button to close the editing panel of Icecream Screen Recorder for Windows.